In the past two decades, environmental sciences have increased their share in the research portfolios of synchrotrons in general, and at the ESRF more specifically. Shaping a sustainable development, imagining renewable materials, improving energy management, understanding and mitigating pollution, etc, require a coordinated, shared and multifaceted approach. Tracing of elements, including those in petrochemical products or identification of toxic concentrations of heavy metals. Study of fuel cells and catalytic converters. Soil analysis for environmental remediation. Permeability and determination of microstructure of rocks, hardening of cement. Limited petrol reserves are pushing oil companies to try to find new access to oil and gas. Drilling companies claim that trillions of cubic feet of shale gas may be recoverable, just in the UK. Accessing the rock is complicated. Kerogen is the organic matter which hosts hydrocarbons in gas shale structures. It is compressed within rocks a million times less permeable than in conventional hydrocarbon reservoirs. Hydraulic fracturing, or fracking, consists of drilling down into the earth and then directing a high-pressure water mixture to the rock that contains gas or oil inside. Researchers still don’t know much about kerogen. More knowledge could open doors to more environmentally-friendly extraction techniques. X-ray microscopy (XRM) image of an untreated sample of gas shale, showing inclusions of pyrite, clay, organic matter and other minerals. Copyright: M. Hubler (MIT) and J. Gelb (Carl Zeiss X-ray Microscopy). The international group of scientists studied four different kerogen samples of different origin and degree of maturation. The X-ray scattering technique on beamlines ID11 andID27 at the ESRF gave them access to the chemical composition of the kerogen, its texture and density. At ID27, the sample was placed in a diamond anvil cell with a pressure of up to 5.1 GPa to reconstruct the conditions underground. Using a hybrid method, combining an arsenal of experiments and molecular simulations, the team developed molecular models of kerogen with different maturities. These atomistic models were then validated by comparing them with experimentally accessible kerogen properties. They unravelled the adsorption, mechanical, and transport properties of this organic matter. The new findings should now help understand the microscopic behaviour of this disordered and heterogeneous matter and open doors to improved extraction technology. iRock Technology Co., Ltd. is a rock-core analysis company with headquarters in Beijing, China. iRock offers integrated services and software to the oil and natural gas industry to provide a better understanding of their reservoirs and to improve recovery in conventional and unconventional reservoirs. A key technology to provide these services is called digital rock analysis. Digital rock analysis is a pore-scale imaging and numerical modelling technology to extract nanometre to centimetre scale geological and petrophysical information, as well as multi-phase fluid-flow data based on pore-scale displacement processes from digitized rock samples. One of the benefits of this technology is the capability to provide a large number of rock properties within a very short time compared to traditional physical laboratory experiments. 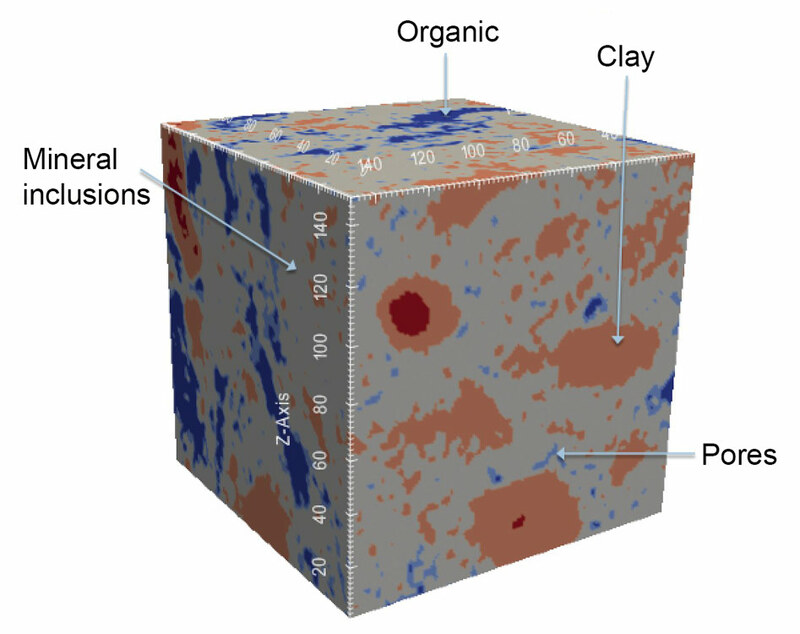 A prerequisite for calculating representative rock properties are high-quality 3D multi-scale images of a rock sample that capture the representative elementary volume (centimetre-millimetre) and at the same time resolve the finest structures, such as the smallest pores (micrometre-nanometre scale). Computed tomography is currently the best-suited technique to acquire 3D images of rock samples over several decades of length scales. Due to the fulminant development of benchtop CT and micro-CT hardware during the past decade, it is nowadays possible to image decimetre to millimetre-sized rock samples at voxel sizes of few hundred microns down to one micron at good quality and within an acceptable time of minutes to several hours per sample. However, CT imaging with benchtop micro-CT machines below 1-micron voxel size are of lower quality and are extremely time consuming (>1 day/sample); imaging below 0.5 microns/voxel is not possible at all, in a reasonable time and with acceptable quality. The crux is that approximately more than 60% of the reservoirs worldwide consist of rocks with very small pore systems, which require imaging at voxel sizes (far) below 1 micrometre with ideal scanning resolutions between 100 and 300 nanometres/voxel. A partial solution is to use a dedicated nano-CT device for imaging but these machines are delicate with respect to stability, maintenance, flexibility in sample and voxel size and scanning times. So is the maximum sample diameter around 60-70micrometres and the voxel size is fixed to 65 nanometres. Even if this machine is used in conjunction with micro-CT we are left with a gap in scanning resolution between 65 nanometres and approx. 1 micrometre per voxel. This is unfortunately exactly the voxel-size range required for the majority of reservoirs rocks. 3D digital rock model and geological, petrophysical and fluid-flow data that are commonly extracted. With their flexibility in energy ranges, spot sizes and detection architecture, beamlines at ESRF can CT-scan our rock samples with varying sample diameters at resolutions ranging from micro- to nano-scale. Due to this capability it is possible to close the resolution gap, which is essential to investigate many reservoir rocks. A regular micro-CT, imaged at 1 micrometre voxel size, shows that a large proportion of the pore space in the rock is unresolved. On ID19, by imaging at 280 nanometres per voxel the results do not show partial volume effects and resolve the entire pore space (Fig. 2). The effects of unresolved voxels in digital rock analysis are dramatic, since a clear segmentation of the rock phases is not possible. Every voxel layer that is classified into a wrong rock phase can offset subsequent calculations by orders of magnitude and leads to inadequate simulation results. Access to the ESRF beamlines offers quick and high-quality imaging at flexible voxel sizes and a range of sample sizes, which is not achievable with laboratory CT machines. The acquired images provide a profound base to build representative 3D digital rock models and extract rock properties at a high confidence level. Next to the image quality, the higher sample throughput compared to laboratory devices helps iRock to plan and conduct projects for the oil and gas industry in shorter time. The oil and gas companies, in turn, benefit from great time savings in comparison to their traditional methods - weeks and months instead of several years for a typical project. Comparison of a carbonate rock imaged with conventional micro-CT (upper panel; 2mm side length, 1 micro-metre voxel size) and synchrotron CT (lower panel; 0.5 mm side length, 280 nm voxel size). To the left are the 3D volumes, to the right are 2D slices across. Black colour is pore space, light grey indicates solid grains and intermediate grey shades are unresolved voxels (partial volume effect).